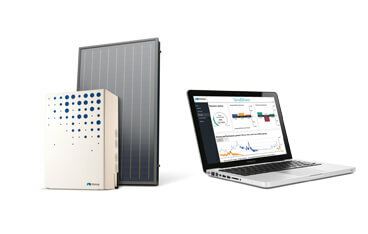 The Moixa Smart Battery allows customers to cut energy bills by storing spare solar instead of exporting it to the network. It also allows them to take advantage of cheap tariffs, importing off-peak generated electricity for use at peak periods. It is a compact (50cm x 30cm x 20cm – smaller than EasyJet hand luggage), wall-mounted unit that fits easily into homes and is quickly installed. Since 2010, Moixa has installed batteries in nearly 1,000 UK homes and achieved an overall operation time of nine million hours. In February, the Moixa Smart Battery was recognised as the 2018 Clean Energy Award’s Most Energy Efficient Product. Moixa’s GridShare platform aggregates multiple distributed batteries, including home and electric vehicle (EV) batteries. This creates a virtual power plant, which can deliver on-demand grid, local electricity network and utility services, helping to reduce the costs of delivering electricity and enabling greater adoption of renewables and EVs. Customers benefit from access to real-time GridShare dashboards, data and analytics showing their energy production, storage, use, grid-sharing and savings, online and in the app. The platform saves users money and ensures the batteries always have sufficient power for their customers’ needs by using machivne learning to optimise battery performance based on behaviour patterns, market prices and weather conditions. The company is also developing software to enable users to manually control the level of charge. Moixa is currently the only company paying UK customers to provide their battery capacity in support of the grid. The company’s GridShare cashback scheme rewards UK customers a minimum of £50 a year. Last month Moixa announced a strategic partnership with ITOCHU, a Fortune 500 company, to launch GridShare in Japan. ITOCHU will install GridShare as standard in its ‘Smart Star’ home battery units in Japan by this summer. This partnership is enabling Moixa to expand into Japan’s world-leading energy innovation market. The country has more than 125,000 energy storage systems, which Moixa and ITOCHU forecast will exceed half a million by 2020. It also boasts the world’s third largest fleet of EVs and the world’s fourth biggest solar market with 11GW generated by home solar PV systems. Working alongside ITOCHU, Moixa will be using its AI-equipped GridShare platform to amalgamate some of these batteries into an interconnected smart grid. The ITOCHU announcement followed investment last year from Japan’s largest utility, Tokyo Electric Power Company (TEPCO) and a partnership with Hitachi to develop a smart energy grid on the Isles of Scilly. This £10.8 million project is laying the foundations for the islands to cut electricity bills by 40% and boost renewables by 40%. Moixa expects continued expansion of its global footprint in 2018, with plans to launch further GridShare roll-outs in Europe and the US. Moixa has recently joined a consortium with leading energy and transport companies to study how to reward drivers who use their electric car batteries to support the UK’s power grid. The project – called V2GB (Vehicle to Grid Britain) – will develop driver-centred business models to support a rapid roll-out of vehicle-to-grid (V2G) technologies, allowing millions of electric car batteries to become a vital part of the UK energy system. The consortium includes National Grid, Western Power Distribution and car manufacturer Nissan’s European Technical Centre, as a part of the Renault-Nissan-Mitsubishi Alliance research activities. Element Energy will coordinate the project and lead the modelling, supported by Moixa, Cenex and the Energy Systems Catapult. Moixa and consultancy Cenex will contribute expertise from the UK’s first domestic V2G trial, which demonstrated that using power from EV batteries to help balance supply and demand could earn around £60 a month per vehicle. The V2GB study is part of a £30 million government initiative to make the UK a world leader in low-carbon vehicles. Analysis by Element Energy shows that without V2G, electric vehicles could account for 30% of new car sales by 2030, with 4.7 million on the road. However, if V2G revenues are available to drivers, with the potential to reduce the total cost of ownership of an EV by £1000, this could see electric vehicles account for 40% of new car sales by 2030, with 6.5 million on the road. It would generate extra sales of 250,000 electric cars and vans, worth £5 billion each year. The study will help to assess how robust these estimates are by identifying drivers of V2G revenues as well as necessary changes of the market and policy environment. For more information and to keep up to date with the Moixa and its trailblazing GridShare platform, visit the company’s website: http://www.moixa.com/.